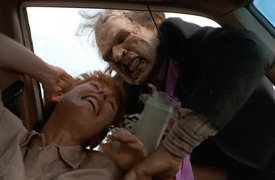 I quite enjoyed the Night of the Living Dead remake, just as I did the first time I saw it years ago. I have to say that this remake compares really well to the original classic NotLD. Of course, with George Romero doing the screenplay, Romero, John Russo and Russ Streiner producing and Tom Savini (who did effects for Dawn of the Dead and Day of the Dead) directing, it damn well should have — that’s an impressive pedigree. It’s weird that this movie got such a lukewarm reception on its release and that Savini hasn’t directed anything else. The direction here seems fine — some of the acting is a little questionable (but never bad enough to derail the movie) but apart from that, this is a great remake. The zombies looked great (not surprising from an effects guy as director), the story was nicely updated (especially love the new ending) and the nods to the first were all very clever and not cheap at all. Considering some of the hack directors working today, Savini deserves another shot behind the camera. Next up is Burial Ground: Nights of Terror — a movie I love for its sheer insanity. It will mark the halfway point for the marathon and kick off the first theme week — five days of Italy’s finest undead mayhem. 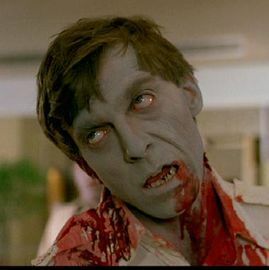 Finally, the second annual Zombie Movie Marathon Month kicked off in fine fashion with Dead Set last night (review here). Starting tomorrow, I will be posting ZMMM Dailies, with the Zombie Movie Marathon Month tag, for easy tracking. 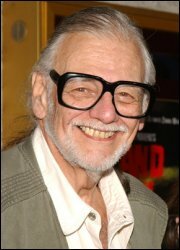 Don’t forget that possibly authentic Romero trailer after the break.